Mittenwald 1946-1951: commemorating the 50th Anniversary of the Ukrainian Displaced Persons Camps in MIttenwald, Germany. Warren, Michigan. Published by the Society of Former Residents of the DP Camps in Mittenwald, Germany, 2001. 753 p. In Ukrainian and English. Contains numerous photographs. Avail. 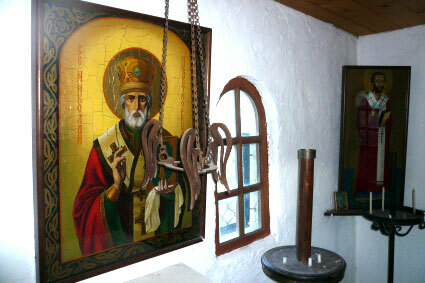 at Shevchenko Scientific Society Library. Attached is a picture of a few men in the Mittenwald DP camp. My step-father is in the front row, far left. He was one of the lucky ones who were able to work for an American company involved in the reconstruction of Germany. He was able to get a good food ration and shared it with my mother. The DPs only got between 1500-2000 calories of food each day -- it kept them from starving but not much else. He also was able to get fresh fruit, mostly apples and oranges, which was a great change from the daily split pea soup the DPs got. 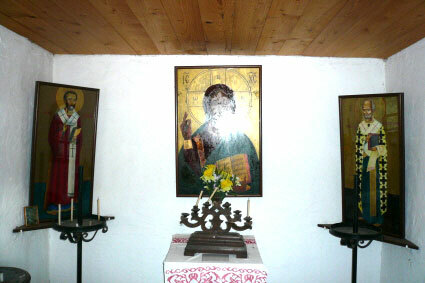 My step-father built the chapel in Mittenwald, and that is where he and my mother were married shortly before we emigrated to the U. S. If you want to post this on your website, that would be fine - maybe someone will recognize one of their relatives. My fathers family emigrated from Ukraine during WW II and spent a number of years in the DP camp in Mittenwald. 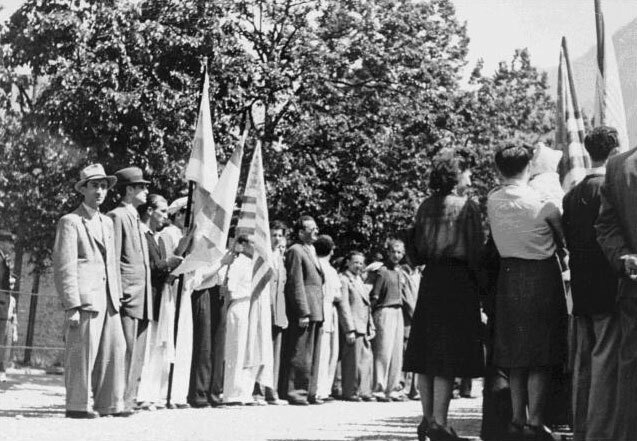 Jewish DPs commemorate the death march from Dachau to Tyrol as they hold a protest against British immigration policy to Palestine at the Mittenwald displaced persons camp. On May 4, 1947, local committees in the communities of Garmisch and Mittenwald proposed re-enacting the American rescue of three thousand Dachau prisoners from a death march to Tyrol in April 1945. This demonstration was intended in part to thank the Americans for their role in the liberation. The Central Committee appropriated the idea and expanded it from a local event to a memorial observance for the entire occupied zone. The centrepiece of the observance was a march to Mittenwald. Four to five thousand marchers participated, including many former prisoners who had actually traversed the same route on the death march from Dachau to Tyrol two years earlier. After marching for almost two hours to the assembly point, the assembled heard survivors of the original Mittenwald march, including the new chairman of the Central Committee, Dovid Treger, who urged them to assume the struggle for the establishment of a Jewish homeland in Palestine. Lieutenant James Charles Rooin especially drew cheers and applause when he declared his admiration for and sympathy with the goals of the marchers. 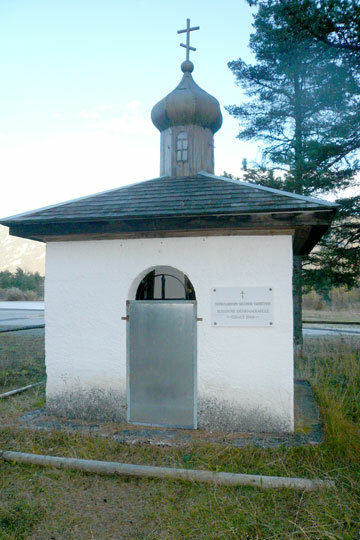 Afterwards the members of the Central Committee assembled in the corner of Mittenwald's Catholic cemetery where those who died in the Tyrol march had been buried, and Treger laid a wreath in the midst of the martyrs' grave. April 1945 – The Death March to Mittenwald, Upper Bavaria. Newspaper clips - What the local press knows. Download original German doc here. On the 28th April, 1945, SS Guards with approx eighteen hundred prisoners from the Dachau Concentration arrived in Mittenwald. The feeble and infirm were camped along the Isar river embankment. Once their guards disappeared they found shelter in nearby barns and sheds. 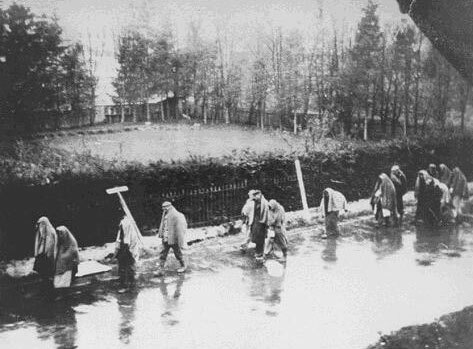 Two thousand concentration camp prisoners from Dachau were assembled on the 1st of May by the SS by the pond in Kruen. The SS wanted to drag this troop of human misery to Austria, but were obstructed by advancing American troops so they decided for a rash annihilation. The starving crowd were cordoned off and surrounded whilst a machine gun was brought into position. The order to shoot these prisoners had already been given. Miraculously they escaped their massacre. An unknown woman begged the Commanding SS Officer for mercy, to let these unlucky souls live. The SS man let himself be talked out of carrying out the execution and disappeared with the lady. The POW’s survived. Garmisch-Partenkirchner Tagblatt, 25.04.1975 – Mittenwald Hospital Chronicle. Like many others, all he did was to pick and read a leaflet that had been dropped from the sky. It explained the parting of Germany into Allied sectors that actually occurred at the end of the war. The pathetic troop from the concentration camp with their wretched depraved souls, as described in the discovered Mittenwald hospital chronicles, were dragging themselves towards Scharnitz (the nearest town on the Austrian side of the boarder) but upon arrival were turned away, and many were left standing along the boarder area. The hospital was hopelessly over filled, the poor starving wretches were completely helpless and occupied every available space possible. They were bedded, or laid on straw. Some were cared for weeks until they were sent to the existing Army Barracks as displaced persons. 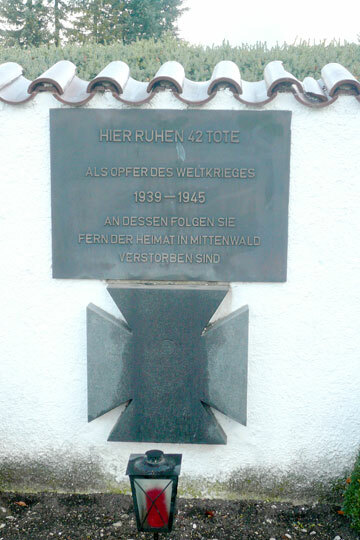 The drama of the long formations concerning the Dachau POW’s that were marched by the SS through the Werdenfels Mountain region ended in Mittenwald. The Nazi Govenour of Tyrol, FranzHofer refused to let them continue their march into Austria. Weakened by the long march, almost exhausted, they were made to camp out in the cold and open skies along the Isar riverbed between Mittenwald and Scharnitz. Once the guards deserted them, the POW’s were found and brought to the abandoned Army Barracks for shelter, and filled the Mittenwald hospital. Some could be transferred to the hospital in Garmisch-Partenkirken for treatment but in the end, unfortunately they all died. 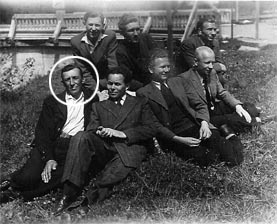 There is one of the POWs from the concentration camp who at the end of the war, and before the Americans arrived, were marched by the SS to through the Werdenfels region to Scharnitz. Many of them died on the side of the streets, like this other unknown person (picture shown taken by Peter Zannantonio). Find Picture! We overtook the troop of concentration camp prisoners who later by Scharnitz, were turned back, and upon our return we saw this man lying by the side of the road. An SS guard kicked him shouting “Russki stand up!” But he didn’t move. We asked the guard to leave the man alone and place a roll of bread next to him. The POW troop rested by Krün. One could hear how the guards beat the poor wretches who wearing were still wearing their striped suits and wooden shoes. A good dozen of the exhausted men were later put on wagons and taken to the hospital in Garmisch- Partenkirchen were they were treated and even given oxygen, but none of them survived. They were all too weak. We put he bodies in the mortuary with the others who had died from their wounds. Their bodies piled up as we didn’t have enough coffins. “For the rest of my life I shall never forget the train of suffering of the POW’s of Dachau that marched from Grainau, or a better description would be dragged along; dressed in rags, emaciated, most could hardly stand, guarded by SS minions and a pack of wolfs. 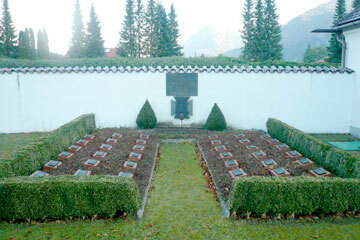 The drama of the Dachau POW’s ended in Mittenwald. The long rows of the forced marched were turned away at Scharnitz by Hofer, the Nazi Governor of Tyrol. Weak and exhausted from the long march the POW’s had to camp by Isar riverbed. Their guards left them and the POW’s searched for shelter. Some brought into the evacuated Army Barracks and many occupied the hospital. Some were taken to the Garmisch Infirmary for treatment. Afterwards multitudes of concentration camp prisoners came marching back from Mittenwald. A few hundred, people who only yesterday had marched towards Seefeld by their SS Guards. Once there they left them and the prisoners turned back. Three of them arrived at the Miller house and told us of their miserable plight. Provided and translated by Anthony Schlega. 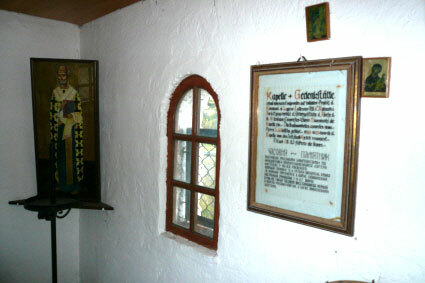 The Catholics held their Mass in a neighbouring farmer's barn. 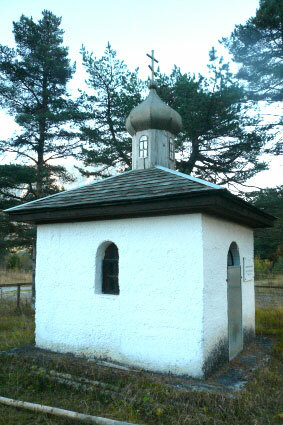 The Orthodox built this small chapel. in reminder of those who died here.